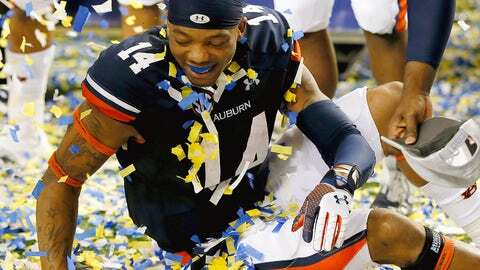 Auburn QB Nick Marshall celebrates after winning the SEC championship. He was something, this friend, foil, frustrator, confidant, co-conspirator of ours. ANTAC – Auburn’s Need To Always Campaign – died Saturday night at the full age of seven days. He is survived by his caretakers, Auburn athletic director Jay Jacobs and SEC commissioner Mike Slive, and the thousands of children he spawned, many of whom dressed in their orange and blue and congregated in Atlanta Saturday night, dutifully carrying his message until time ticked out on his 11th hour. ANTAC wasn’t a pioneer. To call him so would reveal a shameful lack of historical understanding, a blatant execution of disrespect towards the generations of voices that came before and spoke with a similar measure of conviction, if not gravitas. But to call him anything less than an American revolutionary would disregard the intensity with which he burned and the formerly immovable forces he set in motion. Few have entered this world with such ferocity and purpose, as he did on the evening of Nov. 30. The No. 4 Tigers had beaten No. 1 Alabama on a play that will live in various forms of family keepsake forever. Chris Davis fielded a 57-yard Alabama field goal that fell short, the score tied at 28 and zero time remaining on the clock, and proceeded to carry the ball 109 yards in the opposite direction, giving Auburn a victory over its in-state rival and the national championship favorite. More importantly, it gave life to the possibility of Auburn competing for a national championship and, therefore, ANTAC his first platform to begin pitching his change. This particular brand of entrenched confidence and charisma defined ANTAC’s life. He had a precious gift for preaching, an almost unbeatable way with the people built on stilts of endearment and strong-handed persistence. It became clear quickly that people responded to his presence and, even more so, the gravitational pull of his belief in Auburn. Within hours of his birth, he had a mass audience gathered at the base of his pulpit, drinking from the cup of championship case-making. “It would be, quite frankly, un-American for us not to get a chance to go to Pasadena if we’re able to beat Missouri,” ANTAC said the morning following his birth. Auburn did beat Missouri to win the SEC championship, finishing the season 12-1 (7-1 SEC), its only transgression coming in Death Valley against LSU. But would that be enough? No, not at the time of Tiger victory. As with any of our lives, ANTAC couldn’t control everything in his. Some things happen just as they do, unrestricted from even the most powerful of wills and determinations and dreams, and even his mission needed a little help. To ensure his message arrived at its intended destination unimpeded, he needed No. 2 Ohio State to lose to Michigan State in the Big Ten championship game. It wasn’t exactly a wish. “I don’t get into feelings and nervousness,” ANTAC said days before the game, perhaps his bravest and most honorable public showing of strength and solidarity among his community. Ohio State losing was just a fact that must find its corner in history and settle there. This didn’t mean ANTAC was above playfully pushing the cosmos, of course. That was precisely his gift, his purpose here in this tangible college football world. He was always more than a simple spokesperson, endearingly arrogant, maybe more like a wildly successful showman. Yes, that’s it — he was a showman. The final outfit he ever wore included a green tie. ANTAC’s native colors were blue and orange, you surely know. Green is the color of Sparta, the fumes of the fossil fuel that powers Michigan State, ANTAC’s last greatest ally, his own savior when he was about out of time for saving everyone else. It was as if he knew his moments were running short, and at the end of everything, what words remain that haven’t been spoken? In his final hours, ANTAC chose to charm before delivering a final message. Please see the following notes about the Auburn football team’s body of work this season. Thank you! ** Auburn has five wins versus ranked teams, the most of any team in the top six of the BCS standings. ** Auburn has won nine consecutive games, with five of those wins coming against ranked opponents, including three against the top 10. ** Auburn has three wins against Top 10 teams, including consecutive wins against the No. 1 and No. 5 teams in the country. ** Auburn has the highest strength of schedule (Sagarin) of any of the teams in the top six of the BCS standings. ** No other team in college football this season has defeated two top-five teams. ** 10 of Auburn’s 13 opponents are bowl eligible, the most of any team in the top 10 of the BCS standings. And with that, he dipped into the night. Ohio State would lose, Auburn would be off to play for the national championship, all the work to do on this earth was done. Now, he was needed somewhere else. You were a shamelessly loving giant among mere mortals. You were fun. Links from around Week 15 in college football. OK, we see you Tre Mason. He ran for 304 yards (!) and four touchdowns on 46 carries (!!) against Missouri. As Mason was going off against Mizzou, Twitter started buzzing about his Heisman candidacy. I don’t subscribe to the “Heisman Moment” thing whatsoever, nor do I think anyone but Florida State quarterback Jameis Winston should win the award, but Mason’s SEC championship performance was so incredible that I could see him getting enough second- and third-place votes to wind up in New York City at the ceremony next week. He would deserve it, too. As Joel A. Erickson writes, what a turnaround for Auburn – from 3-9 to an SEC title and, possibly, a national crown. By the end of Saturday night, Auburn was saying War Damn Sparty. It was pretty cool to see a live shot of Toomer’s Corner around 11:30 p.m. local time, with the streets flooded and toilet paper draped over the wires and the whole town celebrating Auburn’s return to the national title game. Awesome scene. Vahe Gregorian writes in the Kansas City Star that losing to Auburn can’t change what Missouri accomplished this season. Vahe is right about that – incredible year for Mizzou. It’s not over, either. Unfortunately, the Tigers will be squeezed out of a BCS bowl, with Alabama all but locked into the Sugar Bowl, but they have a good chance to going to the Cotton and playing a good team. It will be an opportunity to end what feels like a landmark season for the program and build some recruiting momentum heading into the offseason. Crazy to think that four months ago, Gary Pinkel was one of the first names mentioned among the coaching hot seat discussions. Tough break for Ohio State, losing to Michigan State in Indianapolis and seeing its shot at a national title slip away. This took the air out of Sunday evening’s bowl selection show, which would have been interesting to see if enough voters would have jumped one-loss Auburn over unbeaten Ohio State (I don’t think so). But, alas, that discussion is now moot. The Buckeyes are likely headed for the Orange Bowl and a meeting with Clemson. Congratulations to the Spartans, who will go to the Rose Bowl for the first time under coach Mark Dantonio. As Mark Snyder writes in the Detroit Free Press, Michigan State QB Connor Cook delivered when he needed to, earning the game’s MVP award. I was so impressed with Cook, who went 24-of-40 for 304 yards and three touchdowns with one interception. The matchup that got most of the attention leading up to the Big Ten title game was Michigan State’s defense against Ohio State’s offense, and rightfully so. But I was more curious to see if Cook could produce enough offensively against a talented – and inconsistent – OSU defense to win. Great night for him, and I’m now eager to see how he does against Stanford’s D in Pasadena. Speaking of Stanford, the Cardinal handled Arizona State in Tempe to win the Pac-12 title. As usual, Tyler Gaffney had a lot to do with it, rushing for 133 yards and three touchdowns on 22 carries. If Michigan State’s defense limits Gaffney, is Kevin Hogan capable of doing enough through the air to give Stanford a chance to win the Rose Bowl? I suspect that will be the question people ask in the pregame coverage. Arizona State won’t go to a BCS bowl, but the Sun Devils are in the same position as Missouri today: They have one more shot to cap off a magnificent season and, potentially, set an attainable goal for 2014. The ACC championship game went about as everyone expected, with Florida State beating Duke 45-7. The Noles are now off to play in the national title. One comment on Florida State’s strength of schedule: Some readers have asked why the ‘Noles have gotten a pass for their weak schedule relative to all the heat Ohio State has taken, which is a fair question to ask. I don’t have a perfect answer – and I despise “the eye test” as an answer – but one thing I think contributes to this is the belief that FSU’s true talent level is superior to perhaps any team in the country. For what it’s worth, Bill Polian said this week that he thinks eight of FSU’s starting 11 players on defense will make NFL rosters. EIGHT. Ohio State has talent, too, of course, and a good counter argument to what I just mentioned is, “Great – but why should having future pros have anything to do with who’s the better college team? Every year, in every sport, we see great college players who won’t ever play professionally.” That’s another debate entirely and a valid stance I wouldn’t refute. I’m just pointing out that I think the perception of Florida State’s actual talent – not its stats or “the eye test” or anything else skewed by its weak competition – has a lot to do with why they have been held nearly as close to the SOS flame as Ohio State has. Meanwhile, Duke didn’t get the outcome it wanted in Charlotte, but hats off to David Cutcliffe and the Blue Devils on a truly historic season. As a Tar Heel, I’m sincere when I wish you an 11th victory of the season in whichever bowl game you end up. Well done. Mr. Bedlam struck again, Jenni Carlson writes today inThe Oklahoman. Tough loss for Oklahoma State. The Pokes had a Fiesta Bowl trip waiting if they could beat Oklahoma at home and just came up short. It was OK State’s 10th loss in the last 11 Bedlam games. As Jason Kersey writes, the Sooners won in Stillwater by pulling off some bold decisions. Berry Tramel gives his post-Bedlam bowl projections. Oklahoma-Alabama will be a massive financial success for the Sugar Bowl – if that’s how it shakes out – but I wonder if OU can keep it in single digits against Alabama. We’ll see. Oklahoma State could end up in the Cotton Bowl against Missouri, which might end up being more entertaining than a Bama-OU matchup. By beating Oklahoma State, the Sooners made the Texas-Baylor game relevant, with the winner taking the Big 12 title and the Fiesta Bowl bid. After a bitterly cold day in Waco, that will be the Bears. BCS buster update: Northern Illinois lost to Bowling Green Friday night in the MAC championship and is out of the BCS bowl running. Central Florida will be the only non-BCS conference team to play in a major bowl, which will likely be the Fiesta bowl against Baylor.